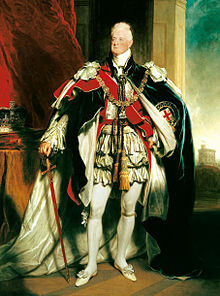 Poor Prince William Henry, third child (and third son) of George III. A girl was supposed to make her way into the world on August 21, 1765 at Buckingham House—or so his parents had hoped. After two bouncing boys, they were ready for a sweet little daughter to join their nursery. As George was already heir to the throne and Frederick slated for the army, it was decided that William should make the navy his career, so at 13 he was sent off to be a midshipman—and actually functioned as one, doing the same work as his fellows, though on any shore visits he was generally received as the King’s son. He visited New York during the American Revolution (where a kidnapping plot approved by Washington was discussed but not carried out), and over the course of his active naval career also visited the Caribbean and Canada on multiple occasions. A good friend of Admiral Nelson, he loved the naval life and was a good sailor, if not a terribly bright officer, bur his active duty ended upon his being made Duke of Clarence at 23. William would have liked to settle down and marry—he was one of the most domesticated of George III’s sons, unlike his two elder brothers—but didn’t particularly wish to marry a foreign princess. So he compromised, wooing and winning the favor of one of the most popular comedic actresses of the day, Dorothea Jordan—and spent the next twenty years with her in non-wedded bliss, eventually raising a family of ten children with her. Those twenty years were also spent in a bit of a funk; William constantly offered his services to both the Navy and as a political figure, and was consistently refused. In many ways he was his own worst enemy, because he simply couldn’t shut up—while his basic views on a topic might be sound, he talked so much nonsense around it that any meaning was lost. So he puttered around his estate at Bushey while Mrs. Jordan became the bread-winner, and so things went—until the problem of the lack of the next generation of legitimate heirs to the throne began to loom very large indeed. William was next in line after his two elder brothers, and of those two brothers, only one had a child capable of inheriting the throne. So William parted (unhappily) with Mrs. Jordan and went in search of a wife—preferably a wealthy one. 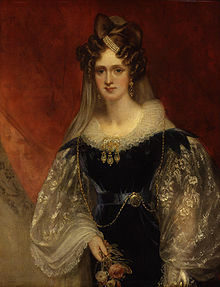 The death of the Prince Regent’s daughter, Charlotte, sent him into high gear, and eventually he was accepted (after being turned down by others) by Princess Adelaide of Saxe-Meiningen, twenty-seven years William’s junior. But to everyone’s surprise, they had a happy marriage, though neither of their children lived more than a few months. William became king upon his elder brother’s death in 1830; his reign is notable chiefly for the passage of the Reform Act of 1832, which cleaned up the rotten and pocket boroughs and more fairly apportioned representation across the population, and for the abolition of slavery through British territory. And of course, he’s known for staying alive long enough to hand the throne directly to his niece, who became Queen Victoria in 1837. He makes for a colorful character in Regency set novels and of course the satirical prints of the day. I like this one http://www.ashmolean.org/exhibitions/lovebites/mgc/map/showpic.php?pid=73 I feel sorry for Mrs. Jordan when she had to be set aside. The surviving children seem to have made out OK. Yes, I feel bad for Mrs. Jordan too--their "divorce" settlement said she'd get an allowance and had custody of their daughters so long as she didn't return to the stage, but William left her with so much debt that she had to--and lost her family. She died, alone and impoverished, in France in 1816. I may love to write about the pretty aspects of this era, but there's so much that isn't.